Eight additional characters free for a period of two weeks. Your Burst Gauge will increase as you perform actions, which will enable you to trigger Burst Mode. In Burst Mode, your attack power will increase significantly for a fixed period of time. You can even connect infinite Aerial Raves. By pressing a specific button in Burst Mode, you can trigger a powerful special attack called “Burst Finish,” which does a clean sweep of enemies, whether they are on the ground or in the sky. Furthermore, if you defeat a boss character in Burst Mode, each character will have a dedicated cut-in in which they completely destroy the opponent’s costume. Marvelous also announced that Miyabi will join Yumi as a paid downloadable content character. Whereas Yumi is part of the game’s “Yumi’s Prequel” story add-on, which is also included with the limited edition, Miyabi will be part of her own “Miyabi’s Prequel” story add-on. In addition to the paid Miyabi and Yumi, the following characters will be available as free downloadable content for a period of two weeks, after which they will cost money: Murakumo, Yozakura, Shiki, Minori, Murasaki, Imu, Ryobi, and Ryona. A release date for the characters were not announced. 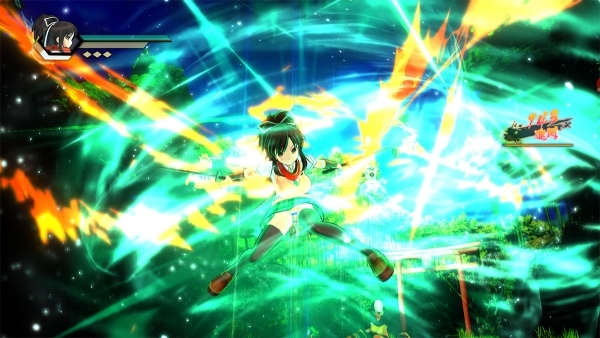 Senran Kagura Burst Re:Newal is due out for PlayStation 4 in Japan on February 22. Watch the Burst Mode trailer below. View the screenshots and character artworks at the gallery.